CSIL Market Research The office furniture market in Brazil provides office furniture market size, trends in office furniture production and consumption, office furniture imports and exports. 2010-2011 official data and 2012 estimates, based on market growth till September 2012. Office furniture production is reported by segment (office seating, operative desks, executive furniture, office storage, wall to wall units). Office furniture imports and exports are broken down by country and geographical area of origin/destination. The research is enriched by an in-depth analysis of the competitive system in terms of company dimension, manufacturing locations and product breakdown. Figures on sales and estimates on market shares of the top 50 office furniture manufacturers operating in Brazil are also available (total office furniture production and segments: seating, operative desks, executive furniture, storage, wall to wall units). About 50 short company profiles for major office furniture manufacturers are also included. An analysis of the market potential focuses on construction sector and office spaces evolution, Brazilian richest cities, luxury retail location and trends in the hospitality sector. About 124 addresses of key players (both manufacturers and architectural companies) are included. The study has been carried out involving direct interviews with over 60 sector firms and distributors operating on the Brazilian market. Most of the interviews have been carried out in Sao Paulo, Bento Gon&ccedil;alves, Rio de Janeiro. The office furniture production in Brazil reached US$ 2,132 million in 2012 at factory prices (4,023 million Reais). Export values represent just 1% of office furniture production. On the other hand imports are steadily increasing (+13% on the basis of half year 2012). Import represents just 3% of domestic consumption due to the high level of import duties on finished products. Top 40 office furniture manufacturers hold 39% of the Brazilian market and 42% in 2012. A growing market share is registered for (in alphabetical order) Alberflex, ArtLine, Bortolini, Cavaletti, Giroflex, Marelli, Todeschini, Voko. Brazilian consumption of office furniture, looked at Local Currency Unit (Real), increased by 15% in 2011 and 10% in 2012. Meaning +5% in real terms (excluding the inflation effect). Office furniture manufacturers operate in the domestic market through licensed/franchised partners (less than 40 showrooms in average) of through independent dealers (more than 300 independent stores in average). - Brazil. 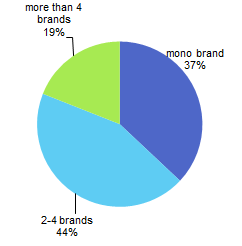 Brands distributed/licensed in a sample of manufacturers. - Brazil. Hotel chains operating in the market. - Brazil. Main architectural companies working in the hospitality market.